Back in 2001 a very small festival popped up in Olcott Beach along Lake Ontario, less than an hour’s drive from Buffalo and Rochester: the first Niagara Celtic Festival. It had both Irish and Scottish activities- something rarely done here at the time. That September weekend saw a few hundred people gather, and though a humble start, they could see great potential. This year marks the 15th anniversary, and the festival now sees over 12,000 guests. The festival's origin began in late 2000 with a chance meeting by Phil and Beth Banks and Paul Krest at the late Connie's Bar & Grill in Olcott. The Banks' were fresh off a visit to Kincardine, Ontario where they delighted in seeing the Canadian's love and celebration of their Scottish heritage. Enter Paul Krest and other Highland athletes following a day of games at Krull Park. Seeing very large, strong men in kilts entering a bar in Olcott then was quite a site to many! But for Phil, he only saw inspiration. Growing up in Olcott, he'd always had an interest in helping revive the wonderful little town that had tourism in its blood. Approaching the men with a round of drinks (of course) the conversation became lively, with Phil and Paul quickly forming a vision of what could be: Celtic heritage celebrated year-round in town. By the following spring, they held their first season of Highland Games, which concluded in September with a grand finale festival, the very first Niagara Celtic Heritage Festival & Highland Games. No one knew at the time whether people would like this new project, but every year the growing family of volunteers continued to pump hours of time and energy towards the goal. It would be five years before the festival and its Celtic heritage would be cemented in the hearts of Western New Yorkers, where it remains today. 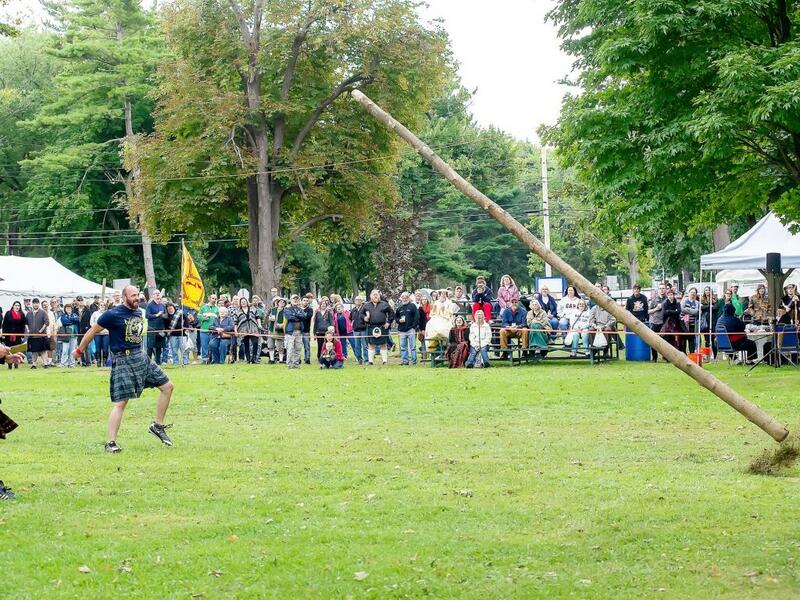 Paul's year-round Highland Games are among the largest in the world, and the Niagara Celtic Festival has become a tradition for countless families...our own local holiday! "We've been fortunate to see attendance significantly grow every year," said festival founder Phil Banks. "We see guests of all ages come to this festival from all over the United States and Canada, as well as visitors from Europe, Australia and other countries." So what has made this festival grow and become so popular? To begin with, it's located in Krull Park, sheltered by trees with a breathtaking view of Lake Ontario. There is a wonderful array of Irish, Scottish and Welsh foods, artisans, performers, craftsmen, animals, historical re-enactors and more. Guests can shop, dine, listen to music, cheer on athletes, learn to swordfight, see animal demos, explore the popular kid's corner, attend classes...the list goes on and on. Of course the most important part of the festival is its hard-working team of volunteers, now nearly 500 people all contributing their talent and skills to help make sure guests have a wonderful time. "You really have to see the festival to understand how amazing it is," explains one of the festival's Associate Directors and Phil's daughter, Vicki Banks. "Every year we have new guests join us that are stunned...they can't believe such a unique and wonderful festival exists in their �backyard'." Visiting their website, NiagaraCeltic.com, you can get a sense at how big and broad the festival is. Photos include guests enjoying a vast variety of entertainment. There are also stars marking groups and performers who've made the festival a tradition as well- awarded to those who've attended for five, ten and fifteen years. MacFarlane's Company is one of a handful of groups recognized as a gold-star 15 year participant. Based in Ohio, they offer hands-on learning of the Scottish, including the chance for children to become soldiers and battle the British. Longtime member Karen Wood has attended since the first year. "I love the many folks who say �My kids played your games at the 1st or 2nd festival and now they are in college or have little ones of their own!'" This year's festival will be held on September 19 and 20. The volunteers have mentioned some additions for their 15th anniversary, although they remain tight-lipped for now. Vicki explains: "We're still finalizing some exciting additions for this year, and they will be announced first on our website and Facebook page. I can say that from the beginning our main priority has always been to give guests a wonderful experience, and everything new fits this ideal perfectly." Pre-Sale tickets are available at their website, and include weekend and day passes, discounts for groups, seniors, students, military and returning guests. Children 12 & under are FREE, and there is also FREE parking. PLEASE NOTE: They anticipate their ticket lines will be a longer wait this year, so they recommend saving time by ordering online. For more information including the event schedule, visit NiagaraCeltic.com or call 716-778-5730.